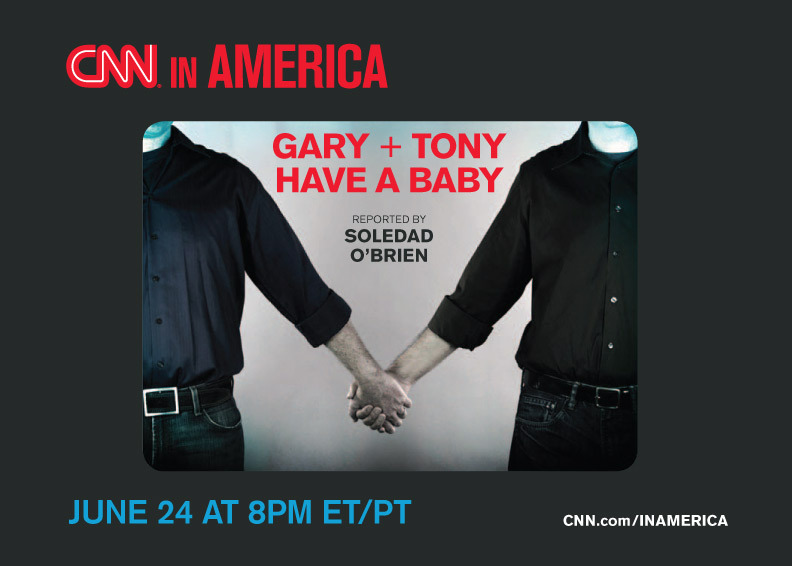 Tonight is the official launch of CNN’s “Gay in America” segments, starting with “Gary and Tony Have a Baby.” The project is part of CNN’s larger “In America” series hosted by Soledad O’Brien, a longtime supporter of NLGJA and our emphasis on fair and accurate coverage of LGBT issues. Unlike a lot of coverage of LGBT issues, CNN has been open about the fact that they aren’t trying to show “all sides of an issue” but instead are exploring the lives of one gay couple as they explore having a family. This approach is a step forward, but has not been without its detractors, even inside the LGBT community. Bil Browning at Bilerico Project criticized the portrayal of gay America pointing out that the subjects were white, affluent, and urban, thus playing into typical media portrayals of the LGBT community. Cathy Renna, who says she has worked with people involved in the project, defends the show but acknowledges the weakness of following a single couple. In addition to the documentary, CNN has a lot of additional content on the Gay in America site which provides even more context and suggests CNN has invested significant effort in starting this series.